These blinged-out rides will help fund reconstruction of trails lost to California wildfires. Every $5 donation puts you in the running to win one of two $10,000 bikes. Santa Cruz Bicycles has mobilized a joint effort of California bicycle industry suppliers and mountain bike advocates to create the “Back On Trail” campaign to fund trail reconstruction projects in the wake of recent large-scale wildfires in Santa Rosa and Santa Barbara, California. A pair of fire-rescue-themed bikes equipped by California-based companies Santa Cruz Bicycles, FOX, Shimano, White Industries and WTB have been created as prizing for the month-long fundraising campaign that will benefit the Redwood Empire Mountain Bike Alliance (REMBA) and the Santa Barbara Mountain Bike Trail Volunteers (SBMTV) who will each spearhead reconstruction efforts in their respective regions. 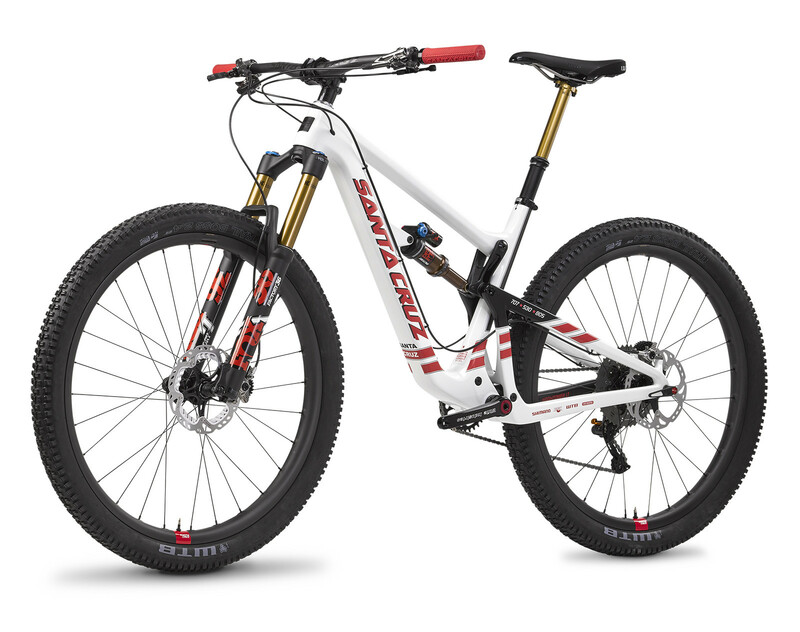 Santa Cruz Bicycles graphic designer Campbell Steers drew inspiration from CalFire firefighting equipment as inspiration for the custom graphics and build spec for the pair of Santa Cruz Hightower LTs that donors to the Back On Trail campaign can win. The red version takes graphic cues from a fire truck, while the white version draws inspiration from a CalFire helicopter. Entries to win the bikes are available by making donations at backontrail.org — with one entry being assigned for every $5 donated. The campaign runs the entire month of February with the two winners chosen on March 1. The Santa Cruz Hightower LT dons fire truck-inspired “Firetower LT” livery for the Back On Trail campaign to benefit trail reconstruction in California’s wildfire impacted areas. Using firefighting equipment as the inspiration, Santa Cruz created two custom-painted bikes—one based on a fire engine, and one based on a CalFire helicopter—in tribute to the efforts of firefighters to contain the blazes and limit their damage. The bikes—each valued at $10,000—feature not only custom graphics, but a custom parts spec from California-based companies. Petaluma-based White Industries is located closest to the fire zone and supplied the cranks, bottom bracket, hubs and headsets for the bikes; Scotts Valley-based FOX supplied forks, shocks and dropper posts; Irvine-based Shimano supplied brakes, shifters, derailleurs and cassettes; and Mill Valley-based WTB supplied tires and saddles. The parts will be mounted to Santa Cruz Hightower LT frames and the wheels built up using Santa Cruz Reserve carbon rims. Santa Rosa’s Trailhouse will host a kickoff party on Friday, February 2 from 6-11 pm which will include raffles and giveaways from Santa Cruz and other sponsors. The event will also be an opportunity to see the bikes in person as they will go on display in Trailhouse’s windows at the party and stay there for the following two weeks. On the 18th, the bikes will be moved to the Topa Topa Brewery in Santa Barbara for a similar party and subsequent bike display. REMBA has identified trail restoration projects in Trione-Annadel State Park as well as at Skyline Wilderness Park as the focus of their efforts, while SBMTV’s project encompass multiple restoration projects in their area. These include including the assessment and repair of front range Santa Barbara area trails heavily impacted by the Thomas Fire and subsequent debris sides; the restoration of the historic Santa Cruz (“Little Pine”) and Buckhorn Trails which have were damaged in prior fires; and working with the Los Padres National Forest to restore and optimize the Snyder Trail (“Knapp’s Castle”) which was bulldozed to create a fire break. Visit BackOnTrail.org for more details and to donate for your chance to win. I love that Santa Cruz does this kind of stuff. Such a good example to the community and to businesses in general.